In the early 20th century, two prayers of island peoples with threatened languages--Hawaii and Cornwall--were documented as ancient traditions within their respective languages. Mysteriously, they are very similar. Both prayers are cries for divine protection from the terrors of darkness, whether on land or at sea, and both were written down (in the earliest text known for certain to exist) within a few years of each other, just over a century ago. The link above is to a pretty entertaining story of the frustrating quest to research the origins of this prayer, which all come to the same dead end--a 1913 text referencing another text from an earlier century, which has never been found. The 1913 document claims that the earlier version was a call-and-response element of a Christian folk litany, the first lines spoken by a priest and the last line given by the congregation. It seems plausible, but we may never know for certain whether it is true. Hem it na nioc inoino, na mocmoea, na pnnohiinohit, na Jiauiiiia. Hemn ola. In an odd bit of further confusing history, David Malo's religious forebear Henry Opukaha’ia (anglicized as "Obookiah," which Sarah Vowell hilariously prefers to use in her Hawaiian history book Unfamiliar Fishes "because it has the word 'book' in it"), the first Hawaiian Christian and missionary of his own colonized people, helped found a mission school in Cornwall, where he died and was buried in a grave that tourists visit today. Oooooooh, the plot thickens! Haha, sorta kidding. 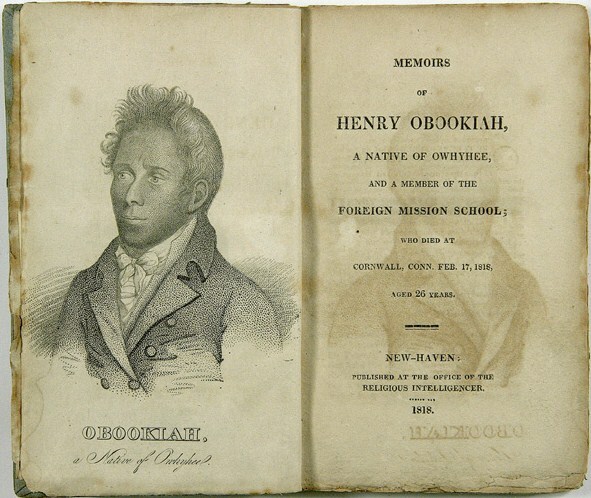 Obookiah's mission school was built in Cornwall, Connecticut, on the East Coast of the United States. But I'm only sorta kidding about a possible direct link between these supposedly ancient oral traditions of Hawaii and the United Kingdom because oral and written information from both cultures was transmitted both ways, over the course of a century before the earliest-known writings of both prayers, via missionaries and commercial sailors. Did one or both of them get tweaked to more closely resemble the other, subconsciously or for reasons of artistic inspiration, before they were committed to the documents we have today? Or is their similarity just a natural result of our common humanity, which might have produced prayers of similar content and style in many cultures throughout the earth, independently? The Cornish people have a habit of calling everyone they meet "cousin," in reference to the underlying truth that we are all related in one human family. Maybe we'll never know for sure. If you know of a similar prayer from the antiquities of a different language, please share in the comments! As you know if you've read this blog for the past few years, I love me a good mythological mystery.